Activins are dimeric growth and differentiation factors which belong to the transforming growth factor-beta (TGF-beta) superfamily of structurally related signaling proteins. Activins signal through a heteromeric complex of receptor serine kinases which include at least two type I (I and IB) and two type II (II and IIB) receptors. These receptors are all transmembrane proteins, composed of a ligand-binding extracellular domain with cysteine-rich region, a transmembrane domain, and a cytoplasmic domain with predicted serine/threonine specificity. Type I receptors are essential for signaling; and type II receptors are required for binding ligands and for expression of type I receptors. Type I and II receptors form a stable complex after ligand binding, resulting in phosphorylation of type I receptors by type II receptors. Type II receptors are considered to be constitutively active kinases. 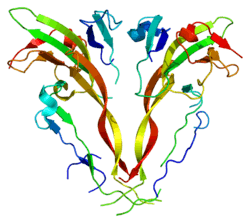 This gene encodes activin A type IIB receptor, which displays a 3- to 4-fold higher affinity for the ligand than activin A type II receptor. ACVR2B has been shown to interact with ACVR1B and SYNJ2BP. ↑ Hildén K, Tuuri T, Erämaa M, Ritvos O (May 1994). "Expression of type II activin receptor genes during differentiation of human K562 cells and cDNA cloning of the human type IIB activin receptor". Blood. 83 (8): 2163–70. PMID 8161782. ↑ Ishikawa S, Kai M, Murata Y, Tamari M, Daigo Y, Murano T, Ogawa M, Nakamura Y (July 1998). "Genomic organization and mapping of the human activin receptor type IIB (hActR-IIB) gene". J. Hum. Genet. 43 (2): 132–4. doi:10.1007/s100380050054. PMID 9621519. 1 2 "Entrez Gene: ACVR2B activin A receptor, type IIB". ↑ De Winter JP, De Vries CJ, Van Achterberg TA, Ameerun RF, Feijen A, Sugino H, De Waele P, Huylebroeck D, Verschueren K, Van Den Eijden-Van Raaij AJ (May 1996). "Truncated activin type II receptors inhibit bioactivity by the formation of heteromeric complexes with activin type I. receptors". Exp. Cell Res. 224 (2): 323–34. doi:10.1006/excr.1996.0142. PMID 8612709. ↑ Matsuzaki T, Hanai S, Kishi H, Liu Z, Bao Y, Kikuchi A, Tsuchida K, Sugino H (May 2002). "Regulation of endocytosis of activin type II receptors by a novel PDZ protein through Ral/Ral-binding protein 1-dependent pathway". J. Biol. Chem. 277 (21): 19008–18. doi:10.1074/jbc.M112472200. PMID 11882656. Human ACVR2B genome location and ACVR2B gene details page in the UCSC Genome Browser. Burdine RD, Schier AF (2000). "Conserved and divergent mechanisms in left-right axis formation". Genes Dev. 14 (7): 763–76. PMID 10766733. Martens JW, de Winter JP, Timmerman MA, McLuskey A, van Schaik RH, Themmen AP, de Jong FH (1997). "Inhibin interferes with activin signaling at the level of the activin receptor complex in Chinese hamster ovary cells". Endocrinology. 138 (7): 2928–36. doi:10.1210/endo.138.7.5250. PMID 9202237. Macías-Silva M, Hoodless PA, Tang SJ, Buchwald M, Wrana JL (1998). "Specific activation of Smad1 signaling pathways by the BMP7 type I receptor, ALK2". J. Biol. Chem. 273 (40): 25628–36. doi:10.1074/jbc.273.40.25628. PMID 9748228. Kosaki R, Gebbia M, Kosaki K, Lewin M, Bowers P, Towbin JA, Casey B (1999). "Left-right axis malformations associated with mutations in ACVR2B, the gene for human activin receptor type IIB". Am. J. Med. Genet. 82 (1): 70–6. doi:10.1002/(SICI)1096-8628(19990101)82:1<70::AID-AJMG14>3.0.CO;2-Y. PMID 9916847. Lee S, Alexander J, Blowes R, Ingram D, Milner AD (1999). "Determination of resonance frequency of the respiratory system in respiratory distress syndrome". Arch. Dis. Child. Fetal Neonatal Ed. 80 (3): F198–202. doi:10.1136/fn.80.3.F198. PMC 1720943 . PMID 10212081. McPherron AC, Lawler AM, Lee SJ (1999). "Regulation of anterior/posterior patterning of the axial skeleton by growth/differentiation factor 11". Nat. Genet. 22 (3): 260–4. doi:10.1038/10320. PMID 10391213. Bondestam J, Horelli-Kuitunen N, Hildén K, Ritvos O, Aaltonen J (1999). "Assignment of ACVR2 and ACVR2B the human activin receptor type II and IIB genes to chromosome bands 2q22.2-->q23.3 and 3p22 and the human follistatin gene (FST) to chromosome 5q11.2 by FISH". Cytogenet. Cell Genet. 87 (3-4): 219–20. doi:10.1159/000015429. PMID 10702675. Choi KC, Kang SK, Nathwani PS, Cheng KW, Auersperg N, Leung PC (2001). "Differential expression of activin/inhibin subunit and activin receptor mRNAs in normal and neoplastic ovarian surface epithelium (OSE)". Mol. Cell. Endocrinol. 174 (1-2): 99–110. doi:10.1016/S0303-7207(00)00447-0. PMID 11306176. Lee SJ, McPherron AC (2001). "Regulation of myostatin activity and muscle growth". Proc. Natl. Acad. Sci. U.S.A. 98 (16): 9306–11. doi:10.1073/pnas.151270098. PMC 55416 . PMID 11459935. Matsuzaki T, Hanai S, Kishi H, Liu Z, Bao Y, Kikuchi A, Tsuchida K, Sugino H (2002). "Regulation of endocytosis of activin type II receptors by a novel PDZ protein through Ral/Ral-binding protein 1-dependent pathway". J. Biol. Chem. 277 (21): 19008–18. doi:10.1074/jbc.M112472200. PMID 11882656. Schneider-Kolsky ME, Manuelpillai U, Waldron K, Dole A, Wallace EM (2002). "The distribution of activin and activin receptors in gestational tissues across human pregnancy and during labour". Placenta. 23 (4): 294–302. doi:10.1053/plac.2002.0787. PMID 11969340.